Subscriptions are shares and options that members sign-up for from the join link. They are delivered on a recurring schedule (e.g. Weekly, Biweekly, Monthly). In order for a member to have an active subscription, they must be subscribed to a share. When members signs up, they must first select a share before they have an opportunity to select any options. - What are Published Subscriptions? 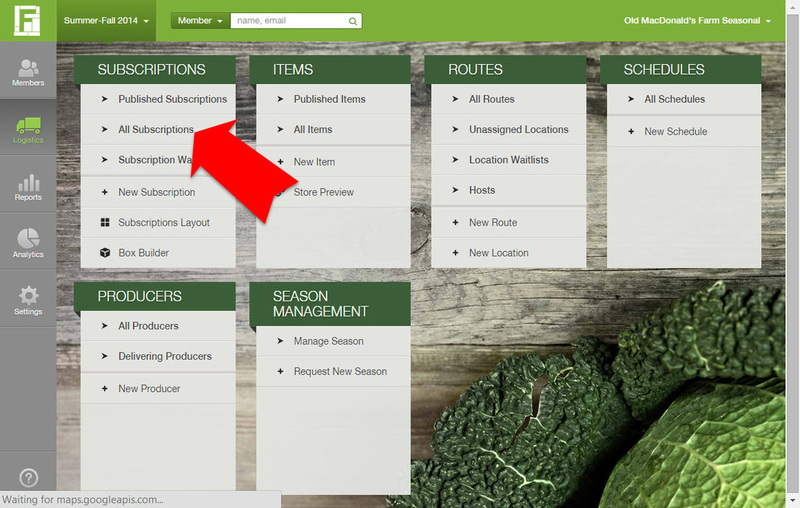 - How do I Add and Edit subscriptions? - How do I manage a Subscription Waitlist? - How do I change the layout of my subscriptions? - How can the Box Builder help me plan deliveries? You can review all the shares and options that you have created from your dashboard by going to the Logistics page and selecting "All Subscriptions" under the Subscriptions section. Read on below to review the features of this area of the dashboard. What can I do from the list of published subscriptions? Sort by clicking column headers: To sort the list of subscriptions, click on the column header for the field that you want to sort by. 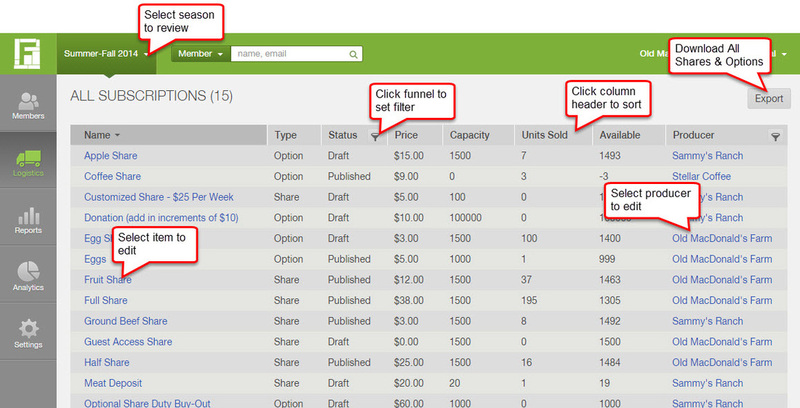 Filter by click on the funnel: Next to the column headers for Producer and Status, you can click the funnel symbol to filter the list for specific producers or a specific status. Download the list by clicking Export: To download a list of all shares and options, click the Export button in the upper right corner. Select a subscription to edit: To edit a specific share or option, click on its name from the list (learn more). Select a producer to edit: To review and edit a producer's profile, click on its name under the Producer column (learn more).